Together with the Tiger Shark and the White Shark, the Bull Shark (Carcharhinus leucas) belongs to the “dangerous sharks“ (any animal could be dangerous to humans). It often stays in the shallow water near the shore and in the estuaries of rivers. Here in the shallow-water area, the underwater visibility is severely limited by sand whirls, even with low swell. In estuaries, where fresh water and salt water are mixed, the visibility is always poor. During my three years’ stay in Richards Bay/Zululand/Natal, I heard of many accidents with the Zambezi Shark, as the Bull Shark is called in this region. A specialty of the Bull Shark is that it can also live in fresh water. In Africa, Central America and South America it is found far into the heartland of lakes and rivers (Zambezi, Mississippi, Amazonas, Nicaragua and Lake Ysabel). The Bull Shark is a sturdy heavyweight (of up to a length of 3.5 metres and a weight of more than 200 kilograms) and is found in tropical and subtropical waters all over the world. It has a low flight distance and approaches a diver directly and self-confidently. 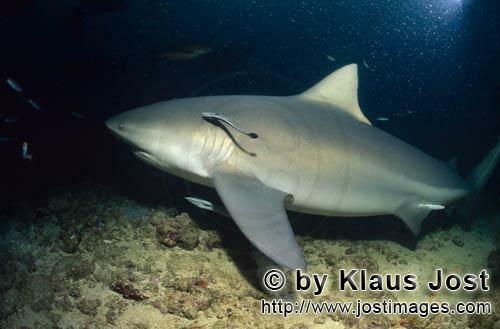 Bull Sharks feed on molluscs, rays, cancers, bone fish and sharks.